I applied to the Peace Corps because I wanted to represent the United States, my country, in a positive light as well as explore another culture in depth. I developed a passion for learning how people view the world through their own unique perspectives while studying anthropology in college. Being of Chinese-American descent, I especially wanted to represent the diversity of the United States in another country where people might not be aware of our cultural and ethnic diversity. As a Peace Corps Volunteer I live in a very small village of about 50 people in the western mountains of the Kyrgyz Republic. Around 130 students from my village and a few surrounding villages come to attend the secondary school where I teach English. My community is a very small, tight-knit group of people who are deeply connected through the Kyrgyz values of family, tradition and cultural identity. 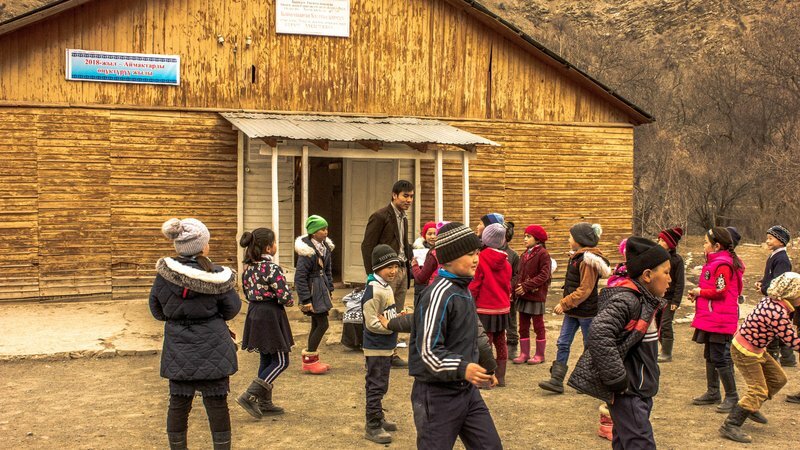 Daniel Yee teaches English in a village located in the western mountains of the Kyrgyz Republic. Growing up Chinese-American, I was raised between two different cultures. From my family, especially my grandparents, I learned the values of Chinese culture, while I learned a variety of perspectives from others with more typical American backgrounds. This helped me adjust to living in the Kyrgyz Republic, as I was already used to balancing the values of different cultures in my own life. When I meet someone for the first time in the Kyrgyz Republic and they learn I’m from the U.S., one of the first words I always hear is “окшош,” meaning “same” or “similar” in the Kyrgyz language. Most Kyrgyz people assume I am a native at first glance. Although it’s not possible to know for sure, I feel my community has found it easier to accept me because of my appearance. The fact that I look Kyrgyz is mostly referred to in a positive light whenever I hear it mentioned. Often when I visit new schools or give a training, I am mistaken for a student due to my appearance as a young Asian person. In addition there are few male teachers, and the vast majority of them are much older than me. Daniel and a local English teacher plan for a Strong Women's Club. In addition, when traveling on public transportation by myself or walking around in unfamiliar places, I have often found my appearance to be an asset. Unlike other Volunteers, who obviously stand out as foreigners, I can blend in and avoid the long stares or long lines of questioning if I so choose. In brief interactions, I can typically get away without having to explain my whole cultural identity, which can be a big relief. The frequency and depth at which I am questioned about my nationality and ethnicity can be tiresome. When I respond that I am indeed an American, and that I was born in the U.S. and my parents were also born there, people eventually accept what I say. At the same time, longer interactions can turn out to be rewarding experiences, allowing me an opportunity to teach others about American identity and to reflect on my own. 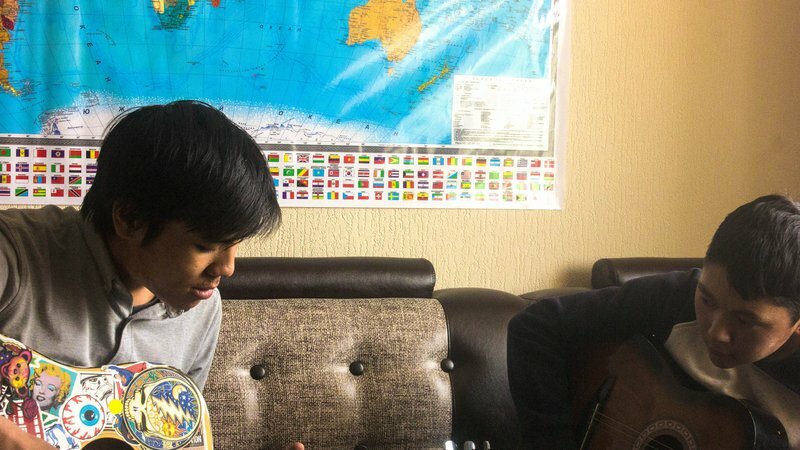 Teaching a student how to play a song during a weekly guitar music club at the local youth center. Relating that my grandparents hail from southern China and immigrated to the United States many years ago has become almost a prepared speech over the years. I have always struggled with my identity as an American. During my childhood in California, I felt like a Chinese person who just happened to be born in the U.S. My first language was Cantonese and because I was raised in large part by my grandparents, I felt much more connected to Chinese culture. I learned more about what it means to be American as I grew older and became more educated, and have as a result become much more accepting of my identity. During my Peace Corps service, I hope to teach Kyrgyz people how open-minded and diverse Americans are. With my host family, I have been able to share a lot about American culture from my experiences growing up in California, as well as about Chinese culture as it was passed down in my family. 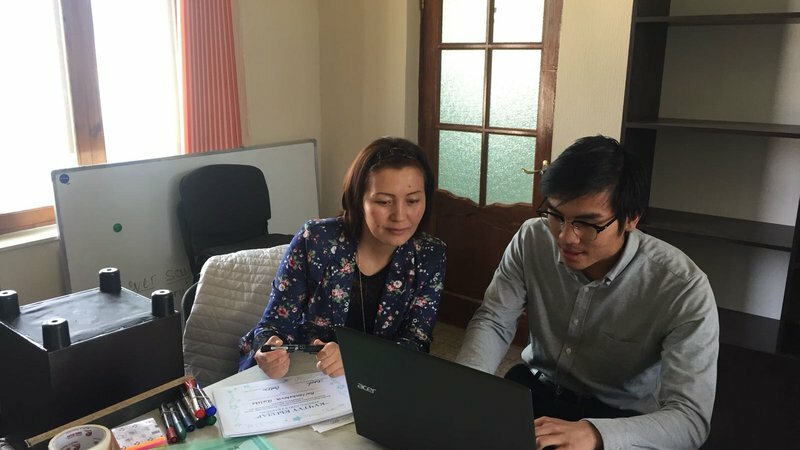 I am working to change the perception of America as a monolithic group of people, helping my Kyrgyz community understand that Americans are individuals who come from a variety of backgrounds. Daniel Yee is an education Volunteer in the Kyrgyz Republic (2017-19).